The Semag-Resal, a vicious alien race from the Nacirema system, have conquered and invaded the earth. In order to maintain their rule, they have established numerous military bases manned by combat drones. These bases secretly double as research facilities for the development of human cyborgs. When completed, these cyborgs will be indistinguishable from normal humans so that they can be used to infiltrate and destroy any remaining pockets of resistance. Scattered bands of rebels are Earth's last hope of breaking Semag rule. 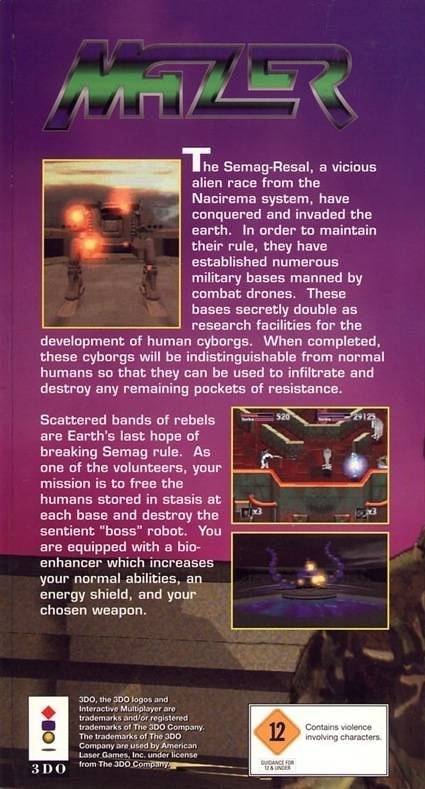 As one of the volunteers, your mission is to free the humans stored in stasis at each base and destroy the sentient "boss" robot. You are equipped with a bio-enhancer which increases your normal abilities, an energy shield, and your chosen weapon.